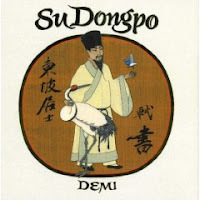 Su Dongpo: Chinese Genius by Demi. Copy supplied by Lee and Low. Picture Book. The Plot: A biography of Su Dongpo (born Su Shi), 1036 to 1101. Had I heard of Su Dongpo before this? Nope. Now I know that he is "the heart and soul of Chinese culture." A superman, almost; a child prodigy and scholar; a government official who got things done; a man who made enemies, saw reversals of fortune, and learned to appreciate all aspects of life. The Good: Beautiful illustrations. You can take a peek at the book, at the publisher Lee and Low's site. To use my niece Cheetah as the test case, as soon as she saw it she wanted to look at it and read it. The illustrations are breathtaking; rich gold borders, brilliant blues, deep reds. I especially liked the two page spread that showed Su Dongpo and his father and brother traveling on the Yangtze River. The illustrations also help show the world that Su Dongpo lived in; for example, the scene of the candidates taking exams, each in his own cubicle, as palace guards look on. Countering one illusion with another? Another good thing: a map. I like to see where things are, to get the sense of how far a person travels, what is really meant by exile. Notes: at the beginning of the book there is a notation about books looked at, and notes on transliterations of certain words and names. Links: Big A little a review. Edited to add the Boston Globe review. I read Liz Rosenberg's review of this book in the Boston Globe yesterday. And now that I have also read your review...I know I am going to order the book. Oh, thanks for the compliment -- and thanks for the info on the Boston Globe review. I'll add it to my links in the review.